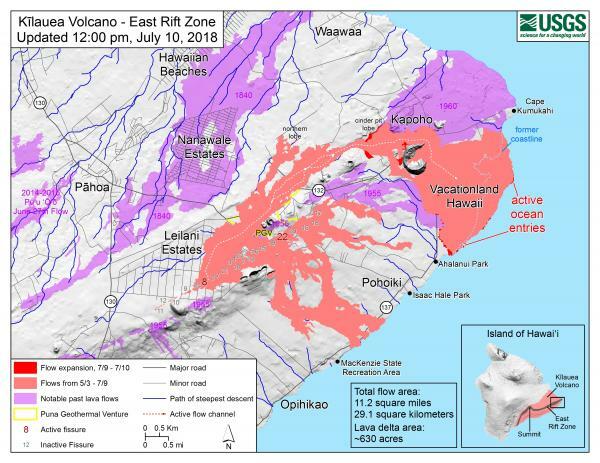 The eruption continues as usual, although lava levels “in the more distant portions of the channel system” are down somewhat. 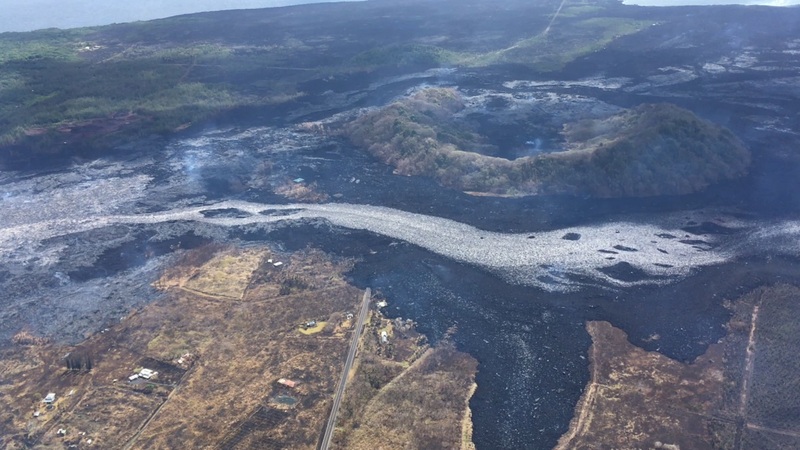 Nevertheless, an afternoon surge after today’s summit collapse caused an overflow and brushfire in an undeveloped area north of the channel, according to Civil Defense. 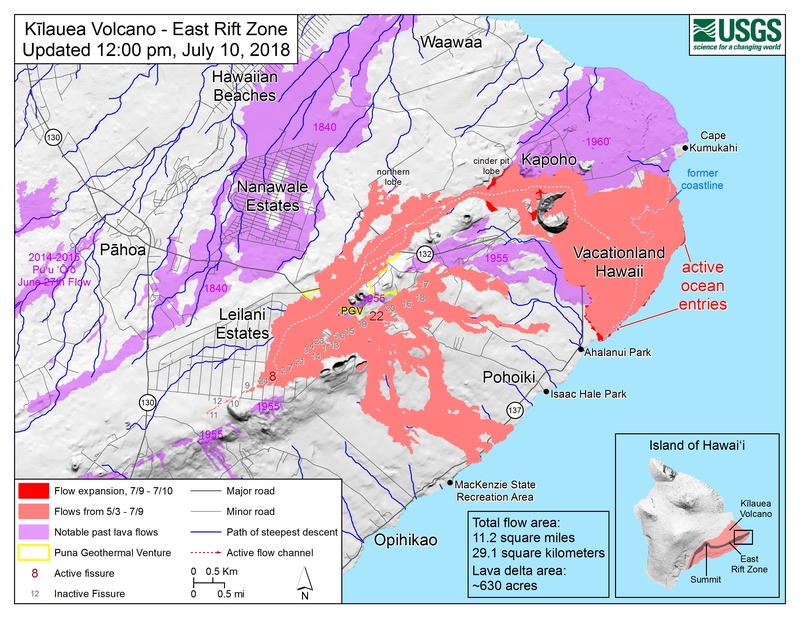 Today’s summit collapse came at 11:55 am HST, energy equivalent of an M 5.4. Once again there was a cluster of high M3 foreshocks in the ten minutes or so beforehand, so that there was already some suspended dust from rockfalls. 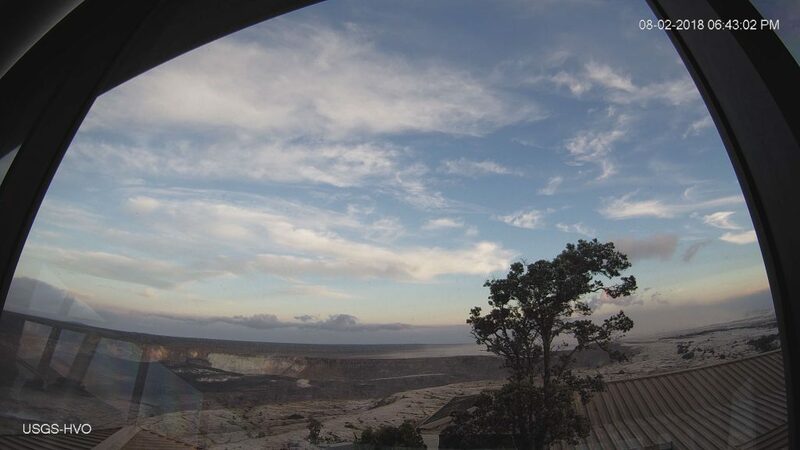 Northeast Rim livestream cam was stuttering today, but still dramatic. 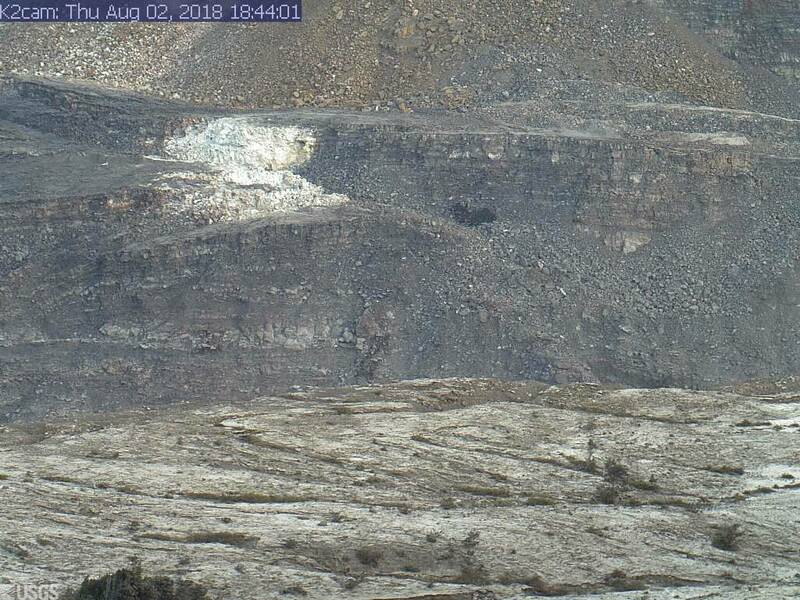 Also note that HVO’s Fissure 8 webcam was damaged by a brushfire Tuesday and ceased working. In fact, right now it’s stuck on the last photo it took. And speaking of photos, I took a night off, and come back to find HVO posted a ton of good photos! Which I shall mirror here so they’re easier to find after they’ve “fallen off” that Photo & Chronology page. Summit collapse event at 2:37 am HST, July 28, 2018. Energy release equivalent to M5.4. 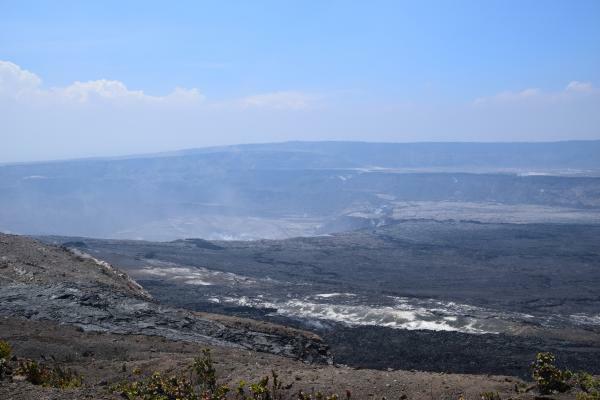 Minor overflows on Fissure 8’s channel reported a few hours afterwards. At the coast, the SW edge of the flow remains stalled 175 m from Pohoiki boat ramp, with ocean entry a few hundred meters to its east. Road crews are monitoring cracks on Highway 130 after increased gas emissions were detected there. We can't say for sure, but we don't think so. We've had long intervals between Type A events in the past, and the channel today appears to be as active as it has been in past days, with overflows on existing lava in some places. Fissure 8 exhibited surge behavior afterwards. 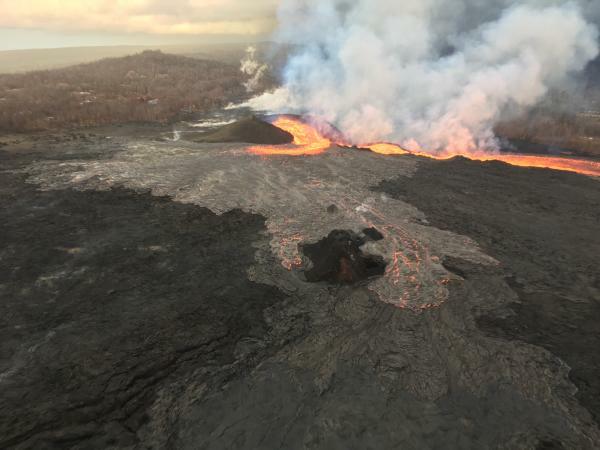 Overnight, drone crews observed minor overflows just northwest of Kapoho Cone, most of which were confined to the existing flow field and/or stopped before traveling far enough to threaten structures. 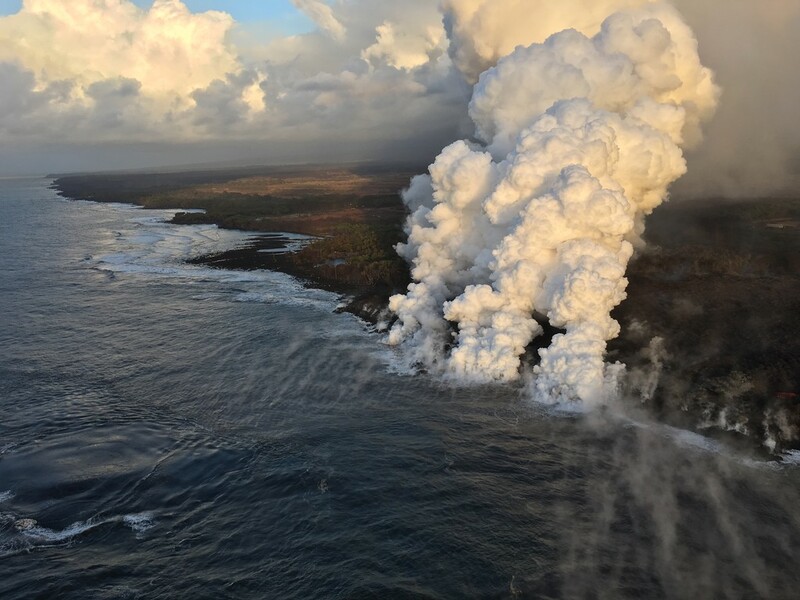 Ikaika Marzo, a lava tour boat operator who stays a sensible distance from shore, reportedly saw lava is in Isaac Hale Park, within 50 m of Pohoiki boat ramp at 7:15 this evening. No summit collapse today, unless the pattern changes; the next one ought to occur tomorrow morning. Full audio file archived here. 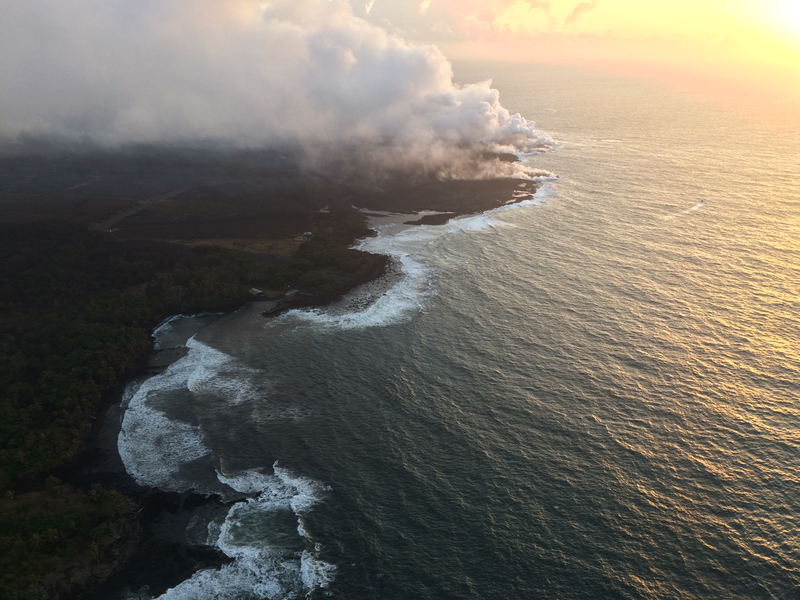 The tiny island that formed Friday is now a tiny peninsula, joined to shore by a neck of lava or possibly just black sand. 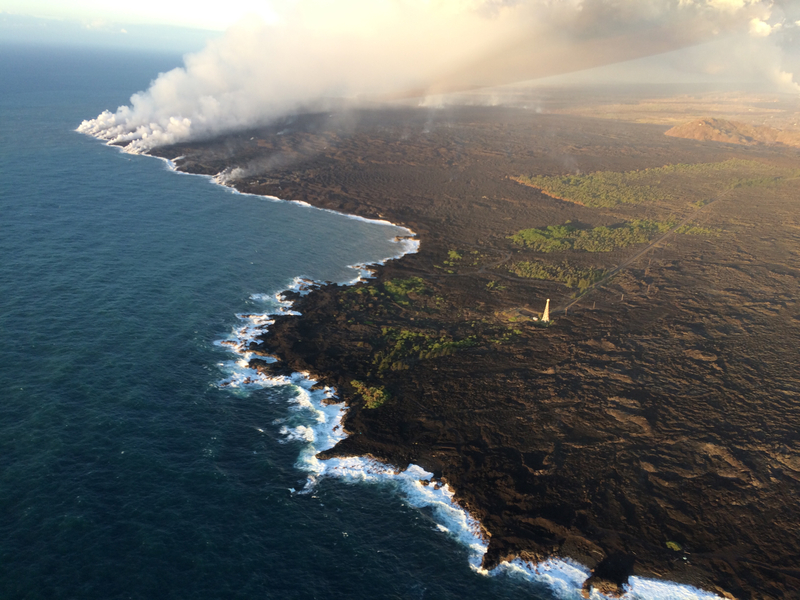 Lava continues to ooze into the ocean here and there along the broad front of 6 km (3.7mi) lava delta. 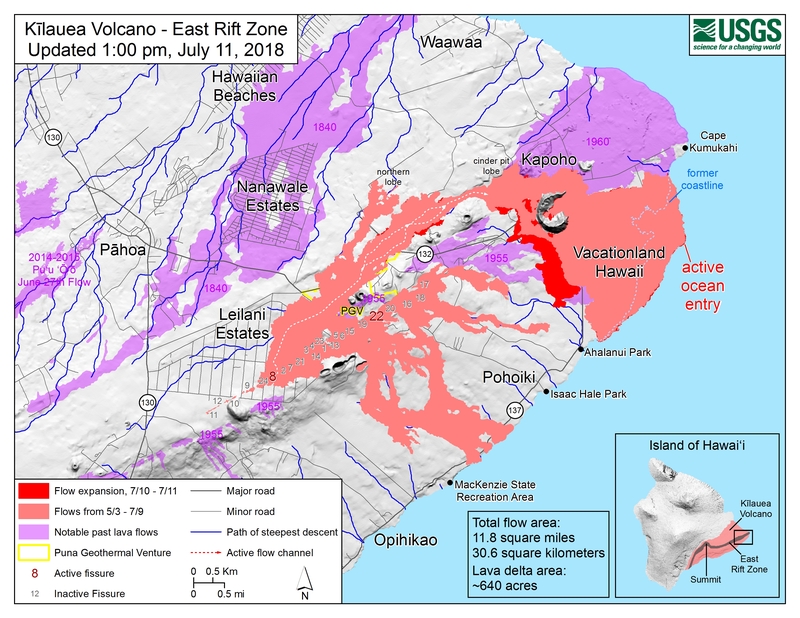 Recent HVO Kilauea status alerts have warned that this delta has built out 0.5 miles from the former coastline, and is resting on “unconsolidated lava fragments and sand,” which can give way. Following this morning’s 3:26 am collapse event (M5.2) at Kilauea’s summit, a pulse of lava came down the rift zone to Fissure 8. 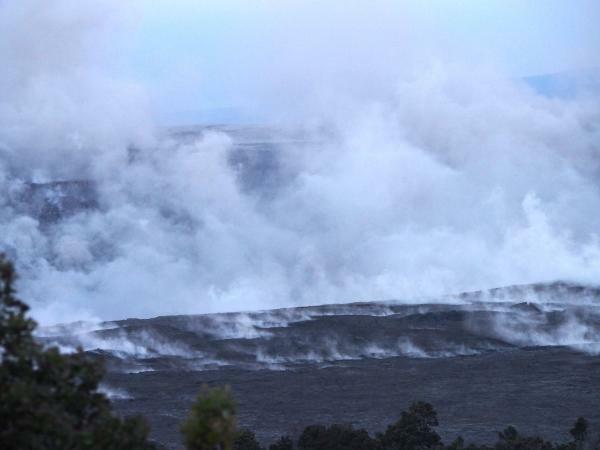 This caused an early-morning, temporary overflow to the ESE which did not extend beyond the boundaries of earlier flows. (This spillover was very visible during a 6:30am @hotseathawaii livestream overflight). No other vents show any activity. Quite a lot happened today in the LERZ. Fissure 8 started overflowing again about 8:30-9am this morning. 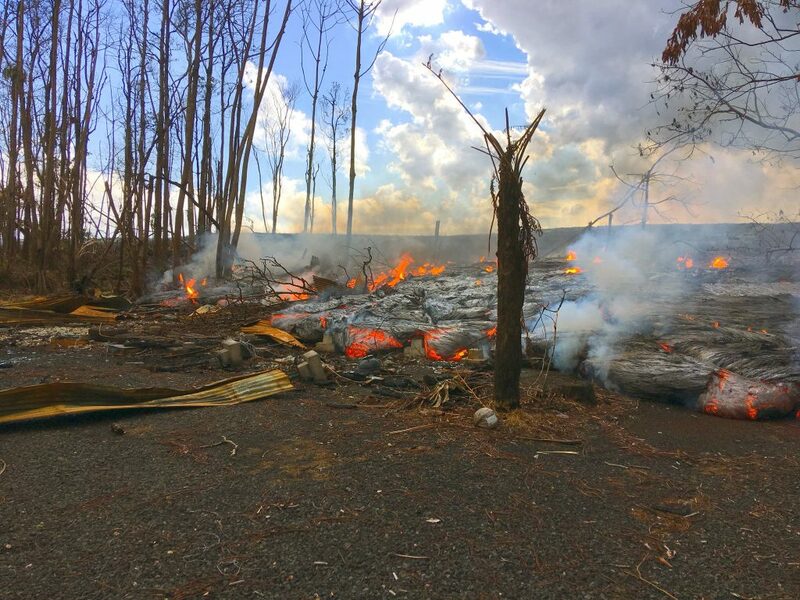 Unfortunately, some spillouts on the north side extended past the edges of previous flows, destroying three more homes in Leilani Estates, two on Luana St, one on Nohea. 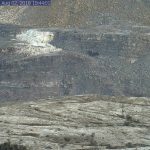 Fissure 22 continues to sputter quietly and intermittently, so the sluggish flow it was emitting a week or so ago has cooled. Transcript of Steve Brantley’s Tuesday evening presentation at the weekly community meeting, July 10, 2018. 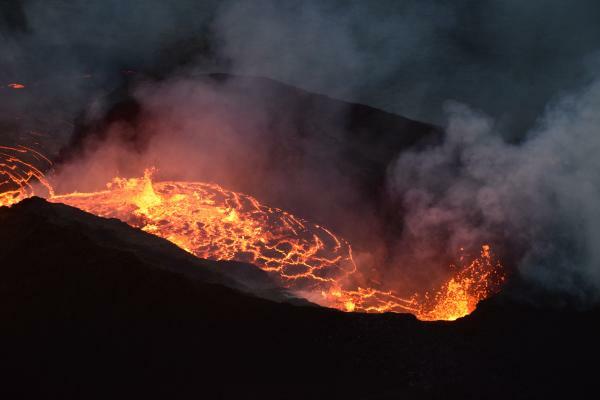 Steve Brantley (HVO/USGS): Well, good evening. Thank you for turning out. I worked really hard this afternoon to prepare my very best presentation for you tonight, and lo and behold, somehow it didn’t end up on my jump drive. So for that, I apologize. And what I’ll do is basically recount the presentation, but you’ll have to— we can refer to the map up here. 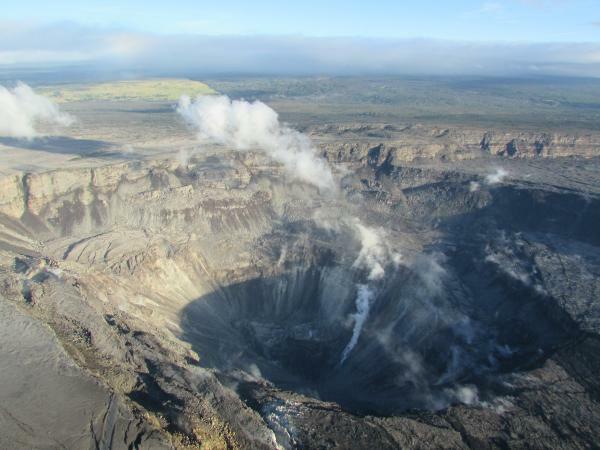 So the overall picture is that the activity at Fissure 8 has not fundamentally changed. 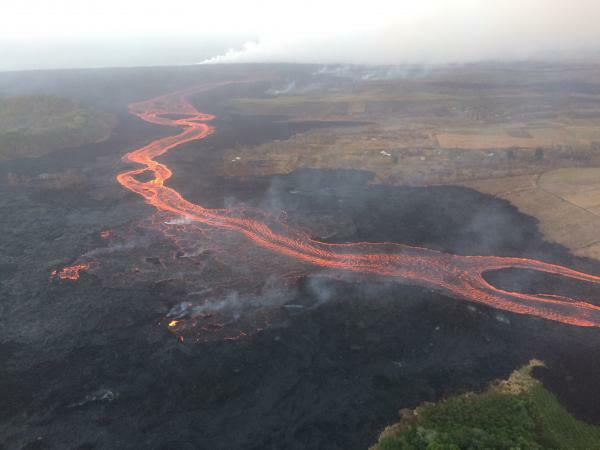 A high rate of lava is still being erupted, and we really haven’t noticed a change in that rate. 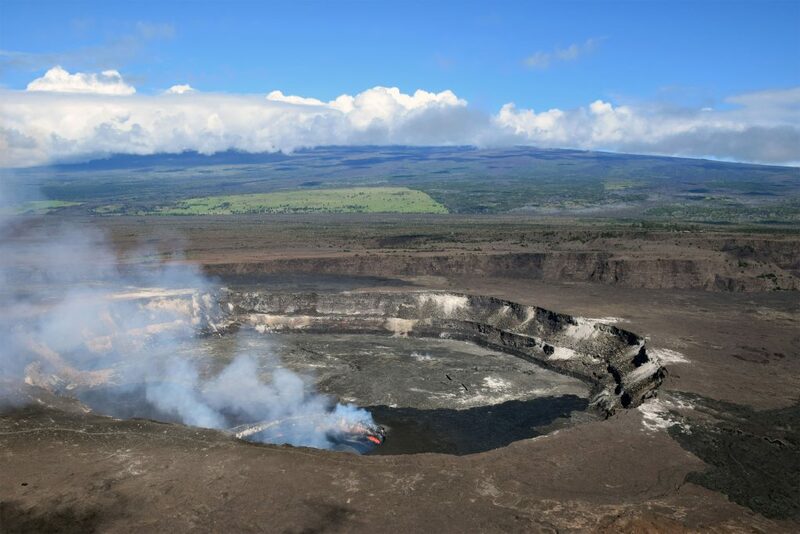 At the summit, the volcano continues to subside very slowly over time, and periodically— now about once every 30 hours, or almost every day— the ground drops as much as two and a half meters or so in each drop, and results in a ground shaking that’s equivalent to about a magnitude 5 event.